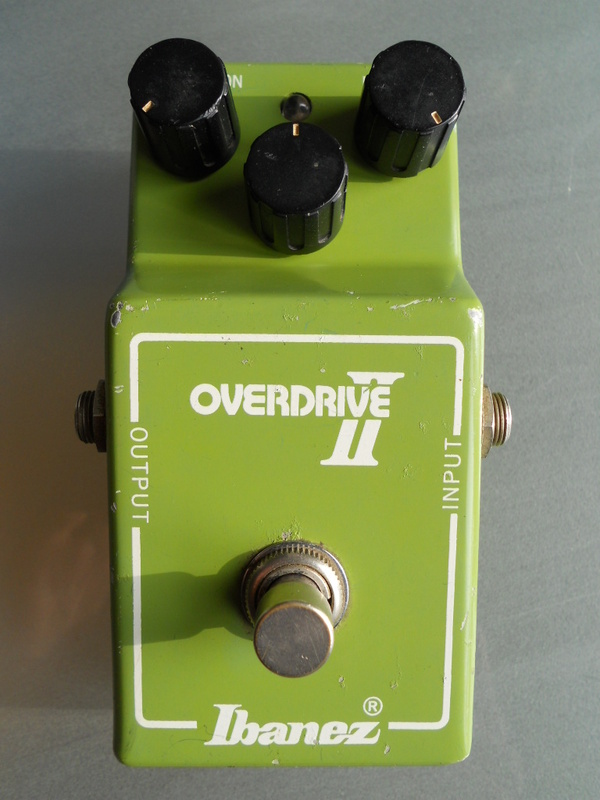 This layout is for the original Overdrive II, not OD-855. The same circuit has been sold as "The Dirt Box" too. 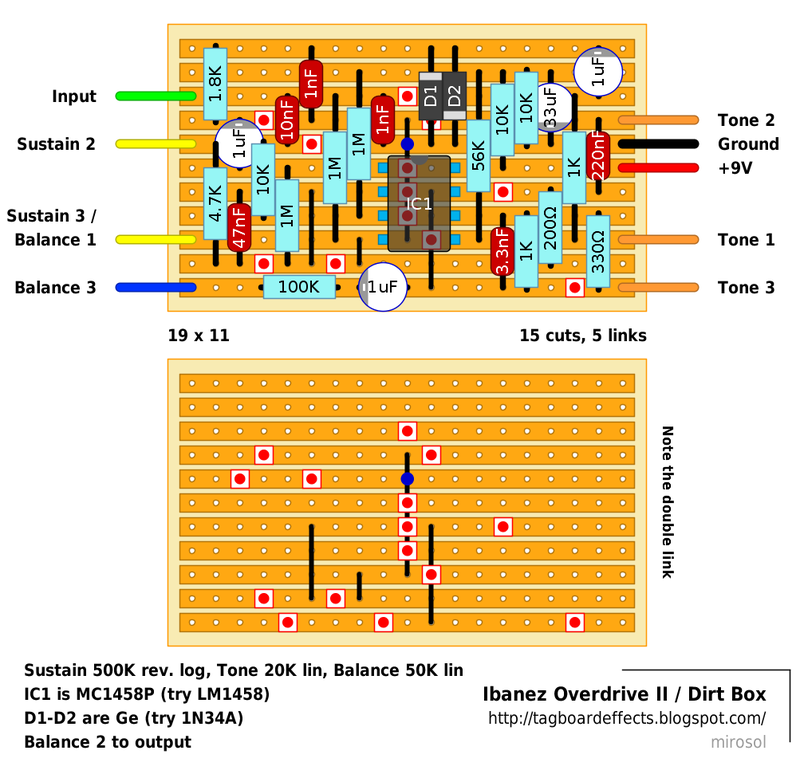 More interesting details of the design at Tonemachines blog. Very nice pedal! I just build it and it's like those old Ibanez pedals, "od" with loads of gain. Just might box this one.. Cool. So you verified it already! Cheers. It's completely different design. 855 has both, in/out buffers and the topolody is different. The stages here are gain -> clipping -> tone, while the stages on 855 are buffer -> tone -> gain -> clipping -> buffer. Thanks Miro, reason for asking is that what I have read makes the dirt box sound like the precursor to the 855 in 1976. Does anyone know what this sounds like? Thanks again Marc, Miro, and all the contributors for keeping this train rolling!!! Dirt Box and original (non 855) Overdrive II are the same circuit. So they should sound 1:1. 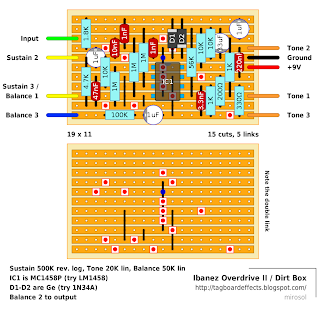 There are good speculation about the Dirt Box origins on the Tonemachines blog. The design here is basically Dist+/OD250 with active tone control after the clipping. Haven't heard the original unit myself, but i suspect it should be very good. Does anyone have the original schematic? I see this one has 27 components and I see on the original photo's that there are 25 or sometimes 26 components. What is the difference? Is this maybe a modded version?